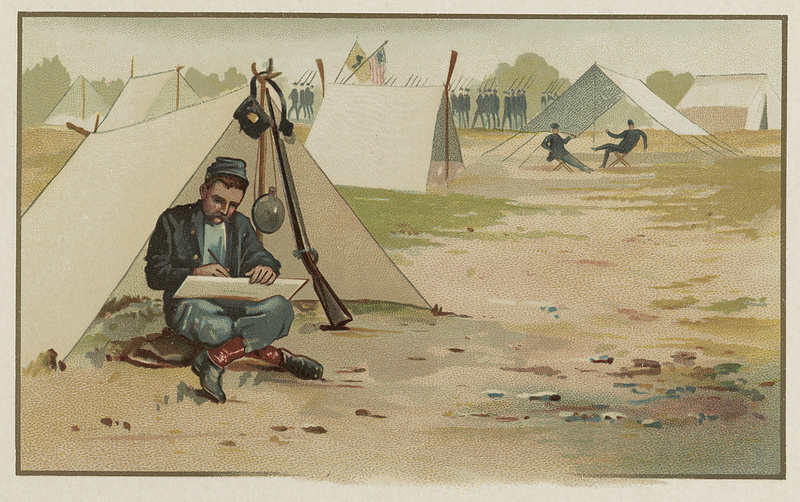 This painting by Charles W. Reed shows an artist at work in camp. It may depict Reed himself. Library of Congress 01234. This photograph, taken on July 6, 1864, at General Orlando B. Willcox's headquarters to the east of the Taylor house (Francis Knowles diary and scrapbook, page 134, UNC Chapel Hill Library) shows two young artists on the staff of General Willcox, Andrew McCallum and Francis Knowles, enjoying combat of a different sort (identification in Scott, 1999, p 573). Detail from Library of Congress 03895. Some of the best known Civil War special artists assigned to newspapers and weekly periodicals illustrated the Petersburg campaign- men like the Waud brothers, Edwin Forbes and Winslow Homer. Three lesser known artists recorded what they saw in their capacity as participant observers- they were all enlistees in the Federal army and chronicled much that is of interest to us today from this vantage point. As soldiers armed with paper and pencil, they were able to record scenes not available to the most intrepid journalistic artists and that were well beyond the purview of the bulky cameras of the day. As other entries make clear, these artists may have copied each other on occasion, or the similarities of their scenes may be the result of sketching from the same locations, such as signal trees. Andrew McCallum was a private in the 109th NY Infantry [later transferred to 51st NY volunteers], was educated as an engineer in Scotland, and later became a patent lawyer and general counsel of the Eastern Railroad Association according to his obituary in the Boston Journal, January 16, 1891. McCallum did many drawings during the Richmond-Petersburg campaign, some of which were published in Frank Leslie's Illustrated Newspaper and are in the Becker Collection at Boston College. Other McCallum drawings and maps are at the Library of Congress, the Virginia Historical Society and the U. S. Army Military History Institute. Francis W. Knowles kept a scrapbook/diary, now at the University of North Carolina, Chapel Hill, and made drawings as a private in Company B of the 36th Massachusetts Volunteers, in the IX Corps. At least one of Knowles’s sketches was published in Frank Leslie’s Illustrated Newspaper and his map of troop deployment during the battle of Fort Stedman, March 25, 1865, was published in an account of the battle. Knowles was on the staff of General Orlando B. Willcox, commander of the 3rd Division, IX Corps, at Petersburg. His diary makes clear that he and McCallum knew each other. Knowles’s drawings, preserved in the diary/scrapbook, note that some images were copied by him, while others were originals. Robert Garth Scott, editor, Forgotten Valor: The Memoirs, Journals & Letters of Orlando B. Willcox, Kent State University Press, Kent, Ohio, 1999, page 546. Interestingly, a recent exhibition catalog of the Becker Collection Civil War artists titled First Hand has McCallum incorrectly identified as a different Scottish born landscape painter.